The sector of Persons with Disabilities (PWD) planned a nationwide action to claim their legal rights. Part of it is filing of a class suit against one of the biggest drug store chains in the country, Mercury Drug Store and the members of the Drug Stores Association of the Philippines (DSAP). On May 12, 2010 more than 20 PWD leaders representing the different disability groups both from national and provincial organizations convened thru the initiative of Mr. Lauro Purcil Jr., board of governor of the Katipunan ng Maykapansanan sa Pilipinas Inc. (KAMPI-NCR). He also presided the meeting. The planned suit came as a result of the reluctance of Mercury Drug and DSAP to implement the provision of Republic Act 9442, which entitles the PWDs twenty percent (20%) discount for the purchase of medicines in all drugstores. RA 9442 was signed by PGMA since last April 30, 2007. ASP Executive Director, Ranil Sorongon, together with Ms. Gigi Ruiz, former Executive Director of National Council for Disability Affairs and Carmen Zubiaga, President of WOW-LEAP (Women on Wheelchairs Leap to Social Progress) were tasked to create a program plan pertaining to this endeavor. A formal complaint will also be submitted to the Food and Drug Administration to issue a “Writ of Mandamus” to compel Mercury Drug and DSAP members to follow the law. The group is looking for lawyers that will serve as legal counsels of the sector. 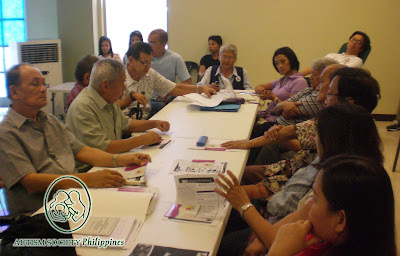 Acknowledgements to Mrs. Mary Ann Cua of Quality Life Discoveries (QLD) for hosting the meeting and providing snacks. QLD is a Special People's Hub, the country's first integrative rehabilitation center that offers holistic services for the well and differently-abled located in Cubao, Quezon City. To know more about the medical and dental privileges of persons with disabilities, click here.